Pre-heat oven to 180 °C. Remove pork shoulder from the plastic bag and return to the foil tray for cooking. Place the foil tray on an oven rack in the middle of the oven. Cook for 30 minutes per 500 g, plus 25 minutes extra. Drizzle with half of the warmed salted caramel glaze in the last 10 minutes of cooking. Slice the roast into 12 equal portion sizes. Mix the Dijon mustard, maple syrup and lemon juice together and season to taste. Lightly toast the knotted rolls and generously butter. Once the pork roast has finished cooking, turn the oven up to the highest grill setting. Place the bacon on a wrack in the oven with a tray set underneath to catch the fat and grill for 3-4 minutes on each side until crispy. Thinly slice the apples just before serving or they will go brown. 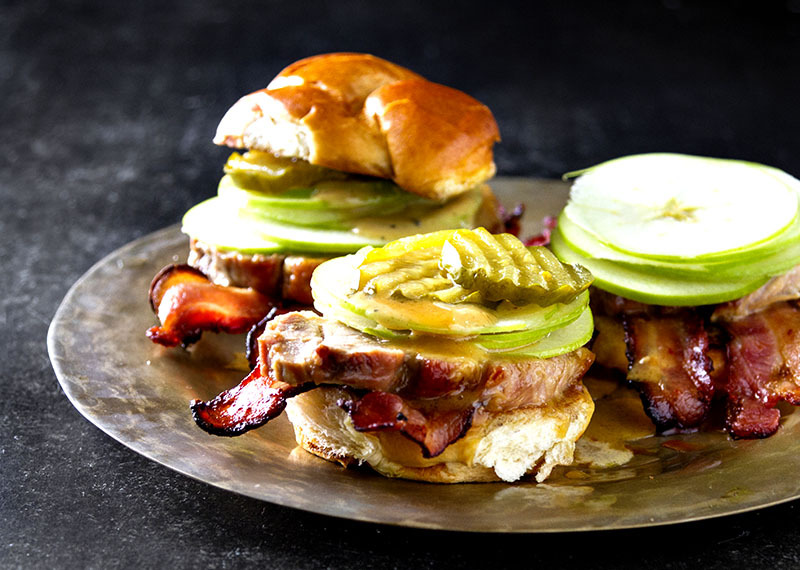 To assemble, slather a layer of the maple mustard, followed by a portion of the warm roast, 2 pieces of bacon, 3-4 slices of apple and finish with sweet maple pickles. Sandwich with the top of the bun and enjoy.